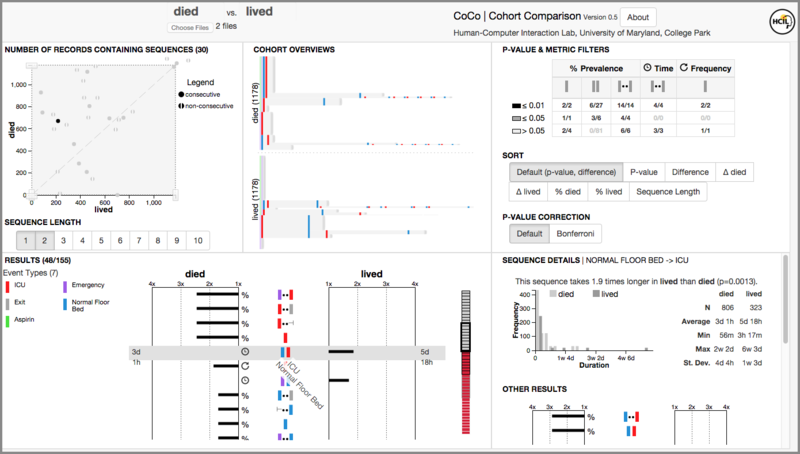 CoCo is a visual analytics tool that enables users to compare two sets of temporal sequence data. It combines automated statistical tests with user-guidance to enable insights, hypothesis generation, and much more. Users see (1) statistics about their dataset, (2) event-level statistics, and (3) a menu of metrics. CoCo displays significance tests in a unified form for measures such as prevalence and duration of gaps. Join us on May 26, 2016 for the HCIL Annual Symposium in College Park. We will have an EvenFlow user group meeting and workshop. Take a look at the 2015 pages for 1) the 2015 Workshop and 2) the HCIL Annual Symposium. Background information at 2014 Workshop on Visualization of Temporal Patterns in EHR data: May 29, 2014, in association with the Annual HCIL Symposium. We gratefully acknowledge the partial funding provided by Oracle Corporation, Adobe Systems, and the University of Maryland/Mpowering the State through the Center for Health-related Informatics and Bioimaging. For non-commercial use: please contact eventflow.umd@gmail.com with a description of your project and organization. Malik, S., Shneiderman, B., Du, F., Plaisant, C., Bjarnadottir, M.
in Proceedings of the 2016 CHI Conference Extended Abstracts on Human Factors in Computing Systems (CHI EA ’16). Links of all HCIL Projects related to Temporal Visualization: EventFlow, LifeLines, LifeLines2, PatternFinder, LifeFlow, etc.